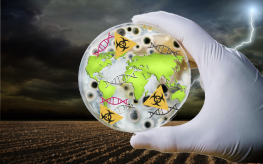 Testbiotech, a nonprofit organization started with independent (‘non-biased’) biotech research in mind, recently released a report on the spread of genetically altered plants. The organization says GMOs are spreading throughout the world without any controls in place to stop them. They have escaped their intended areas and are moving into the environment and even infringing on wild plant populations. This is happening everywhere and something must be done to stop it before it worsens. In the U.S., Canada, Central America, Japan, China, Australia, and Europe, genetically modified organisms are spreading into the food system. This is happening with corn, rice, cotton, flaxseed, bentgrass, and poplar trees, according to the Testbiotech report. “Coexistence between genetically engineered crops and biodiversity is not possible if crops are spreading into wild populations without control. Industry is contaminating biodiversity and our future seeds – who will hold them responsible?” says Margarida Silva from the GMO-free Platform in Portugal, according to GM Watch. GM Wheat – An unapproved strain of genetically modified wheat was discovered in an Oregon field earlier this year. The Roundup Ready strain was nixed in 2005 when global resistance to Monsanto forced the company to stop working on it. It was never approved for use, let along growing and exporting. GM Flax – Genetically modified flax seeds from the 1990s are still being found across the globe. GM Rice – During 2006 and 2007, three different strains of genetically modified rice were found in US rice exports and subsequently the world over. There were three specific strains of rice—one of which was approved in the U.S. and the other two which were not. Still, none of the strains were approved for cultivation or consumption anywhere else in the world. In total, the GM rice was found in more than 30 countries. To make matters worse, the USDA now considers GMO contamination “normal”. Testbiotech says there are several reasons for “transgene escape”. They say the future impact of this unregulated spread of GM technology is, quite simply, unknown. Apart from commercial cultivation and experimental field trials, losses from the import and transport of viable grains for food and feed production are a source of uncontrolled dispersal. The consequences cannot be reliably predicted, and from the cases documented in the overview it is evident that no prediction can be made on how these plants will behave in the long-term or interact with biodiversity. The organization is calling on EU Commissioner Tonio Borg, who is pushing for GMO authorization throughout the EU, to honestly assess the consequences of GM technology. But, if they’ve infiltrated even wild plant relatives, removal is doubtful. The entire report, entitled “Transgene Escape: Global atlas of uncontrolled spread of genetically engineered plants,” can be found here. Do we know exactly when they became self-aware? Yes, but when they plant those precious seeds they will be contaminated, too. And “just deserts”! they will suffer the consequences of this Pandora’s Box that has been opened onto the entire ecology! The real problem is the lack of immediate accountability and ethical regulation. The people who infest the racketeering world of teleological pseudo-science and invest so much time and commitment in this utterly weaponized stupidity, will be long gone and probably dead by the time the real world consequences are reliably tracked and inventoried. If we do not invoke the precautionary principle with stalwart ecologically informed determination & robustly prevent, future generations shall be lamenting indeed. The only thing that seems to work is the one thing we don’t desire. We do not desire violence. Those who study us, the citizens, know this. We are given opportunities to sign petitions, to comment, to march which gives us the illusion of participation, but the abominations keep coming, from GMOs, to pipelines, to fracking and chemtrails. Those who lead the protest fear the “V” word, emphasizing the word peaceful and the marketing firms gloat and say, “See, we have them right where we predicted.” And they do, for there is already no way to un-leash GMOs. There is probably no way to stop Agenda 21. We, those who love monarch butterflies and nutrient rich foods, must act for our sanity. Maybe the likes of Monsanto have a plan to tell people “oh well, everything is getting contaminated now with GMOs, so you might as well accept them because they’ve already damaged your natural plants beyond recovery.” Fait accomplis. “The organization is calling on EU Commissioner Tonio Borg,…” oh crikey, what an appropriate surname…. This is why I think it’s a waste of time to vote “label GMOs”. If and when that ever happens, GMO’s will have contaminated everything. We need to start voting to BAN them now before it’s too late. Time isn’t on our side in this matter! Once the majority of Humans are diseased to death from GMOs, and other life ending tactics the NWO folks will just head to their seed pantry, aka the Svalbard Global Seed Vault or Doomsday seed vault, and begin living their utopian fantasy. They are not kidding around. They believe the planet belongs to them yet the people, paralyzed in fear, do nothing.